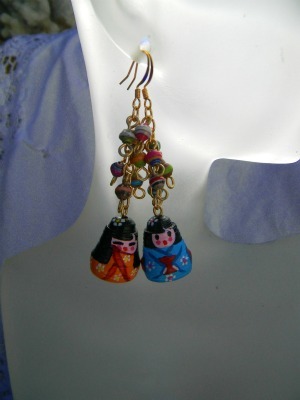 These hand painted kokeshi dolls (Japanese dolls) is another work of art by Manou. If you remember, Manou made the matryoskas in a similar fashion. I just loved these little faces they are soooo cute! They remind me of that designer fragrance with the cute Japanese faces:) Something that can be worn by women of all ages. Manou is making more for me and when I get it I will have one pair giveaway and put the rest on etsy. Wow these are my favorite manou is so clever with her works of art, I wish I could make one too. Wow!!! love these! I want a pair so bad rite now! So adorable I love them! a great team effort Janice and Manou! wow, Janice!! they are so beautiful earrings!! what a great idea to put them together ….so lovely with these beautiful small paper beads colored …!!! many thanks and Congratulations!! Those turned out so cute Janice! Manou is quite talented that’s for sure!